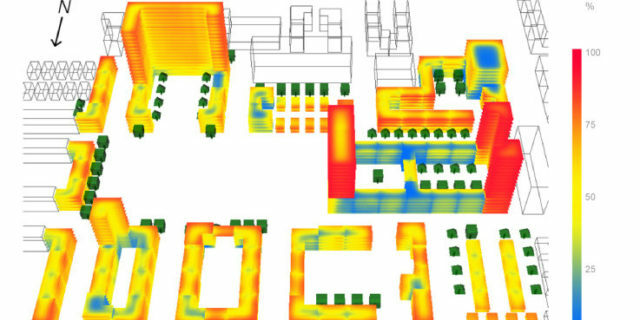 Umi is an urban modeling platform run by MIT’s Sustainable Design Lab, which estimates the environmental performance of buildings and cities with modules for embodied energy, walkability, and daylight and shading. Since 2012, Umi has been developed by the Sustainable Design Lab at the Massachusetts Institute of Technology with support from a National Science Foundation EFRI_SEED project, the MIT Energy Initiative, the Kuwait-MIT Center, the Center for Complex Engineering Systems (CCES) at KACST and MIT, Transsolar Climate Engineering and United Technologies Corporation. Further tool developed is now also being conducted at the Environmental Systems Lab at Cornell University. The MIT Sustainable Design Lab has created a web portal named Umiverse, where all the urban-level simulation projects based on their Rhino-integrated UMI. These projects have been conducted either in classes on Urban Modeling at MIT and/or as part of larger activities with external partners worldwide. Below, you can see an example of a project realized in Kuwait.